No, this isn’t a treatise on whether or not Americans should have the right to bear arms. My question, however, is just how safe or sane are the increasing number of people who “forget” to remove their weapon from carry-on bags when they head to the airport? Year after year, the TSA reports new record numbers of weapons being seized at airports across the country. Last week, the TSA hit a new one-week record, discovering 96 firearms in carry-on bags at airports across America. Of these weapons, 85 were loaded and 26 had a round in the chamber. In Milwaukee, the TSA even found an “inert” grenade in a man’s shoe. The security agency also saw its highest-ever, single-day seizure of weapons in February, when it confiscated 21 firearms in one day. As these numbers grow, I shudder to think about could happen when you blend a weapon with a round in the chamber and a case of extreme turbulence. Or, an intoxicated passenger. On a more practical level, each time a weapon is found, security lines slow to a crawl and, in some cases, this can result in a full evacuation of the terminal. For those who haven’t had the experience, this leads to a decidedly “not fun day” at the airport. The way I see it, one of two things are at play here. Either these select weapon owners are truly so lackadaisical about carrying a firearm—and not storing them safely in their home when not in use—they truly did forget it they were carrying it. Or they’re playing a giant game of chicken with the federal government. If you’re playing chicken, stop it. If you’re simply forgetting to check your bag, stop that too. Try as I might, I just have a hard time believing the “oopsies” defense. Every day, regular passengers triple check shampoos and lotions for proper liquid sizes, search their bags for forgotten water bottles and consult websites to see if items like tweezers and lithium batteries are prohibited or not. Admittedly, not every passenger does this, but their penalty for failure to do so isn’t a hefty fine and a possible arrest warrant. So why are so many weapons owners forgetting to do a cursory check of their bags? Interestingly, it’s not just airports. Canada, which requires a declaration of all firearms carried across the border, has seen gun seizures nearly triple between 2012 and 2016 according to WGRZ TV in Buffalo, New York. “The vast majority (91 percent) of firearms seizures are rendered against U.S. residents who are opting to travel to Canada during favorable highway conditions and most are very likely traveling with firearms for the purpose of self-protection,” read a document from Canada Border Service Agency (CBSA), according to Global News. In 2016, the CBSA initiated a PR campaign urging Americans to leave their guns at home. "It is strongly recommended that you not carry your firearm when traveling to Canada and/or transiting through Canada to reach another U.S. destination," said the CBSA in a press release it issued last year. "However, should you choose to travel with your firearms, you must declare all firearms in your possession at the first Canadian designated port of entry. 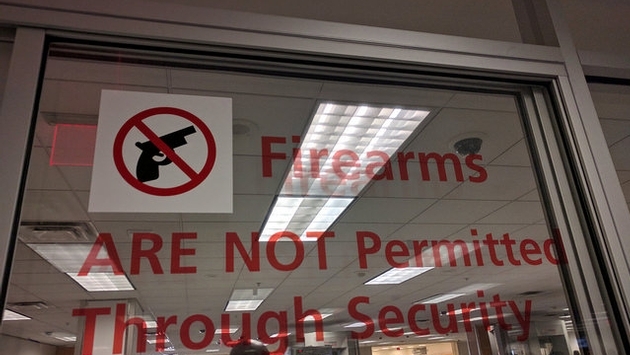 You must also have all the necessary permits and have your firearm appropriately stored." Last month, “2 On Your Side” News (WGRZ) investigated the four bridges in Western New York and found that 70 weapons had been confiscated so far this year. Those seizures have resulted in 22 charges. These charges come with hefty penalties in Canada, including fines starting at $1,000 and confiscation of your weapon. Your vehicle could also be seized, and you might be permanently prohibited from entering the nation. Your “I forgot” excuse isn’t going to fly at American airports, either. The TSA can charge civil fines of up to $11,000. That doesn’t take into account local regulations, which vary by city and state, but might also include a prison sentence. His court date is set for later this month and he could face up to 10 years in prison. No matter how many times Pettyjohn claims he accidentally grabbed the wrong bag when packing, he’s still become a poster child. Since it is unlikely that a “too dumb to carry” law ever makes it on the books, it bears reiterating that owners of firearms should please remember they’re carrying a lethal weapon. Quit dropping it in the bottom of your bag like it’s an abandoned tube of lipstick or a forgotten stick of chewing gum. And please, if you’re headed to the airport, double check your bag to make sure you aren’t about to ruin your day. Monica Poling, the evening and weekend editor at TravelPulse.com, has been writing about travel for more than 20 years. Although she enjoys far-flung experiences, she is equally obsessed with the off-the-beaten-path destinations in her own backyard. Read about her latest travel experiences on her blog, www.travelglitter.com.